What is our Tackling Mental Health at Work program about? These are wise words from Graham Long, CEO and Pastor from The Wayside Chapel, a place where special moments are created under the guise of their mission of ‘creating community with no us and them‘. It is this idea that ‘there is no such thing as a single human being‘, (we are social beings), that informs our Tackling Mental Health program. Hear more from Graham on “the privatization of self” HERE. During the workshop we provide participants with an introduction to how they can plan for a more holistic understanding of mental health, including the very social nature of our being, in their workplace. We build on this thought, and anchor to it, during the entire program. In doing this, we recognise that there are many challenges associated with mental health at work that may be considered a wicked problem. That is, the type of challenge where there may be many different, often competing aspects to ‘good’ mental health, that are perhaps better ‘tackled‘ rather than ‘solved‘ or ‘fixed‘. So if we are to tackle mental health in the workplace, we need to better understand it as more than simply a cognitive or biological ‘problem’. In order to move in this direction, we have to accept the very paradoxical nature of our being as a human. That is, to better understand the mystery and paradox that is being as an individual in a social world. This program will help you and your team to understand this paradox and support you to implement a more holistic approach to mental health in your workplace. 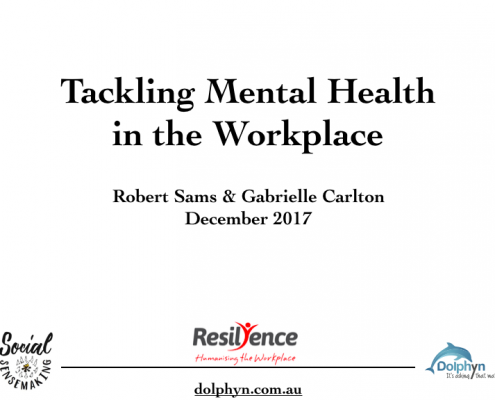 It is often co-presented by Gab Carlton from Resilyence and Dolphyn’s Rob Sams. Our short introductory program aims to assist you and your team in creating a holistic approach to mental health and how it may impact people at work. We do this by sharing tools and tips for how you can actively support people who are experiencing a challenges with their mental health. Grief – what is it? how to deal with it? why do we need to better understand it? Why tackle and rather than fix mental health in the workplace? What do the facilitators bring to the table? In addition to his role at Dolphyn, Rob is leads the service team for Lifeline across many regions in Australia such as the Hunter, Central Coast Northern Rivers and South West Victoria. These services include: face to face counselling, community support and training programs. He is a passionate mental health advocate and has specialist knowledge of social psychology, suicide prevention and counselling. Gab has a degree in Psychology and post graduate qualifications in social psychology as well as being a qualified Mental Health First Aid Facilitator. Gab has many years experience in organisational and personal coaching and uses this combination of skills, leadership experience and expertise to guide other leaders in understanding how to best support people, and organisations, in tackling mental health at work. What are people saying about the program? What is i-thou and what are the ‘ups and downs‘ referred to above? As noted above, this program certainly avoids a linear approach to understanding people and in particular mental health. To better understand our thoughts on this, and the many comments above that refer to “i-thou”, we recommend watching his video featuring Graham Long HERE. We use this video as a focal point for the program. Why might you want to come along? This Workshop is for participants who are looking to explore the experiences and challenges that they have, or may face in relation mental health at work. By the end of this short Workshop, participants will be better equipped to deal with them. Gab and Rob will guide a conversation in an environment where people feel safe to speak about and share their experiences. Would you licontact@dolphyn.com.auke to book a Workshop or learn more? That’s great, just drop us a line at robert@dolphyn.com.au or call Rob on 0424 037 112 (+612 for Australia).